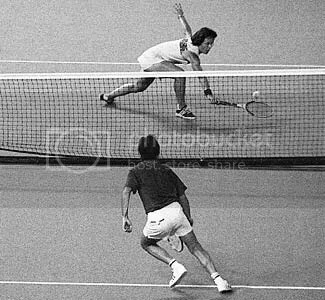 In 1973, Bobby Riggs and Billie Jean King captured the interest of a nation by participating in a tennis match labelled “The Battle of the Sexes”. The media frenzy leading up to the match brought tennis, momentarily, to the forefront of American sport. Riggs was outspoken and sexist (it may have been an act) claiming that the women’s tennis game was inferior to the men’s. King went on to beat the 55-year-old handedly–Riggs was clearly past his prime. Over 30,000 people were in attendance at the Houston Astrodome to watch the match, a tennis attendance record that stands to this day. Sports historians will likely find flaws in the following statement, however, I see this match as the point that marked the end of the laurel-wearing, upper-crust era of tennis and ushered in a new era that featured increased showmanship and spectacle. With tennis being a revitalized sport across the nation, Gottlieb capitalized, and released Volley, their tennis-themed wedgehead, and did so to coincide with the 1976 US Open, America’s largest and most popular tournament. I’m not a tennis fan. I know the basics and will watch it, but only if it is on a waiting room television at a dentist’s office or auto garage. I went through a brief phase where I had a turbo crush on Martina Hingis and watched a lot of women’s tennis in the 1990s, however, today it is not a sport that I follow. My love of tennis these days is limited to Volley. Gottlieb expertly crafted this single-player game–it is easy to learn, pretty straight forward and a ton of fun. 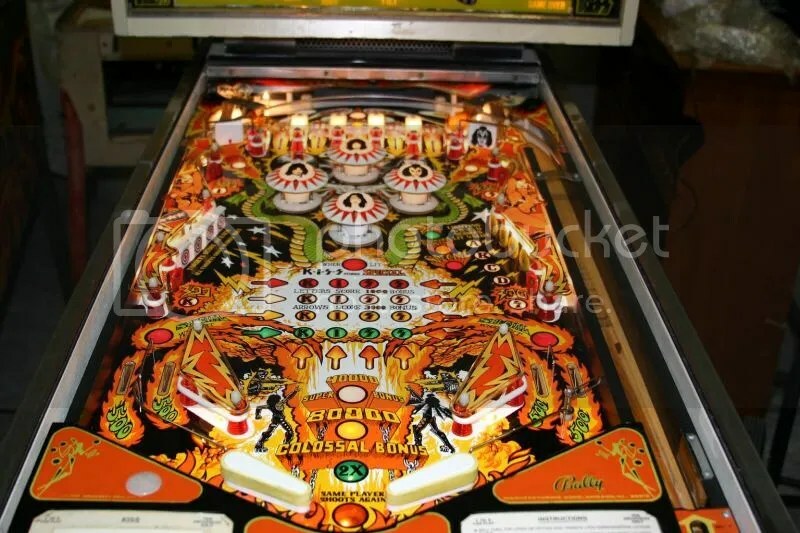 As stated in the introduction, Volley was released in August of 1976, and came from the prolific designer/artist duo of Ed Krynski/Gordon Morison, a team responsible for over one hundred Gottlieb games that spanned from EM Wedgeheads to early Solid State System 1s. That number may be bloated, as many games by Krynski and Morison were just redesigns of popular layouts with artwork differences to accommodate the add-a-ball/replay needs of different US states and countries. However Volley was not one of them. It was released as a replay game only, and no add-a-ball/WOW! 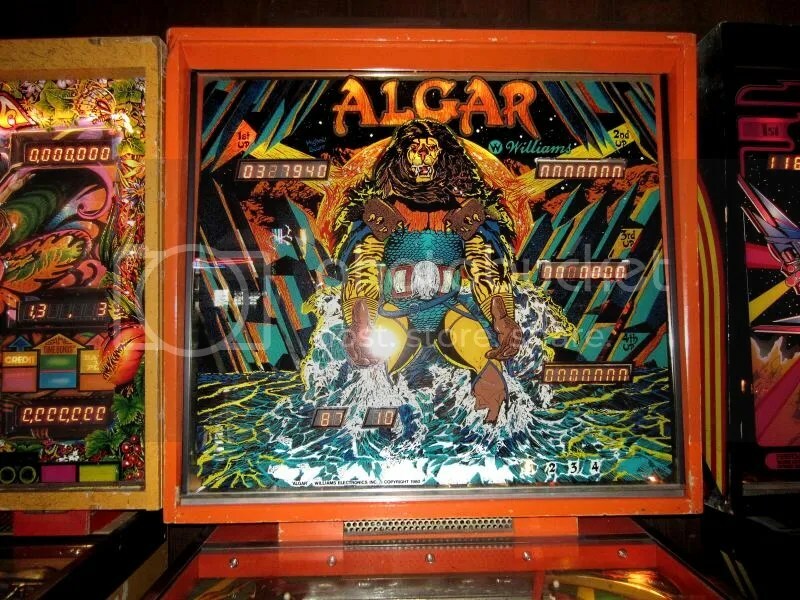 or 4-player version exists. If we observe tennis as a fad conjured up by the media in the mid-70s, Morison’s art captures it completely–the pink and orange pastels, umbrella’d spectators, and one-piece tennis mini-skirts. 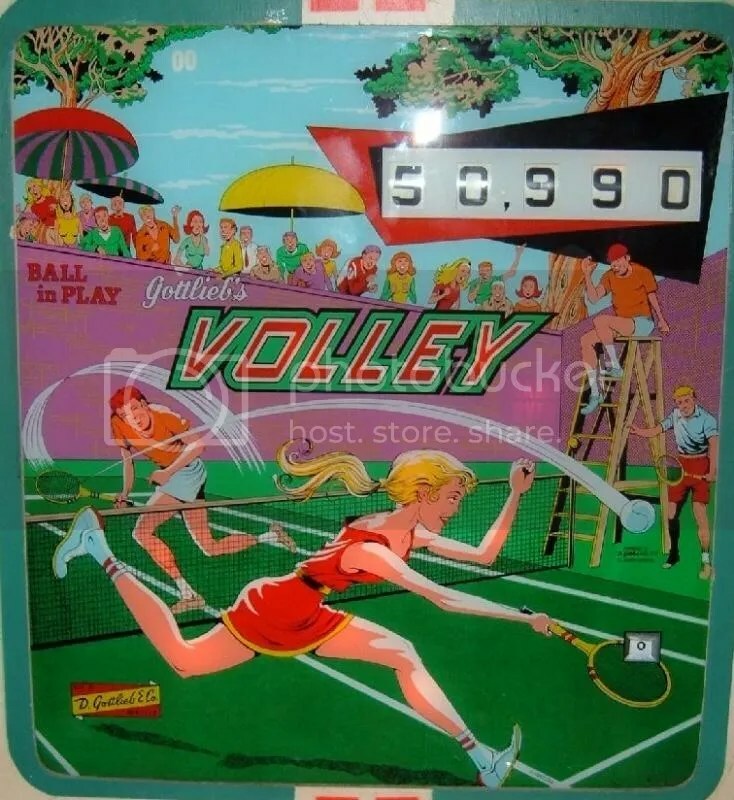 It shouldn’t be overlooked that the main backglass image features a man playing a woman in a competitive game of tennis a la Riggs vs. King. The side art, even with its minimalist two-colour-on-white composition, depicts a male versus female tennis exchange, with the muscular female’s hair in a short bob reminiscent of King’s. 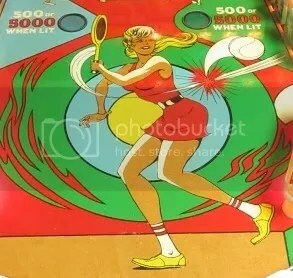 A more buxom blonde, showing off her, ahem, “forehand”, is placed front and centre on the playfield, which is pretty typical for Morison at Gottlieb. He loved featuring attractive blondes in a variety of social situations. 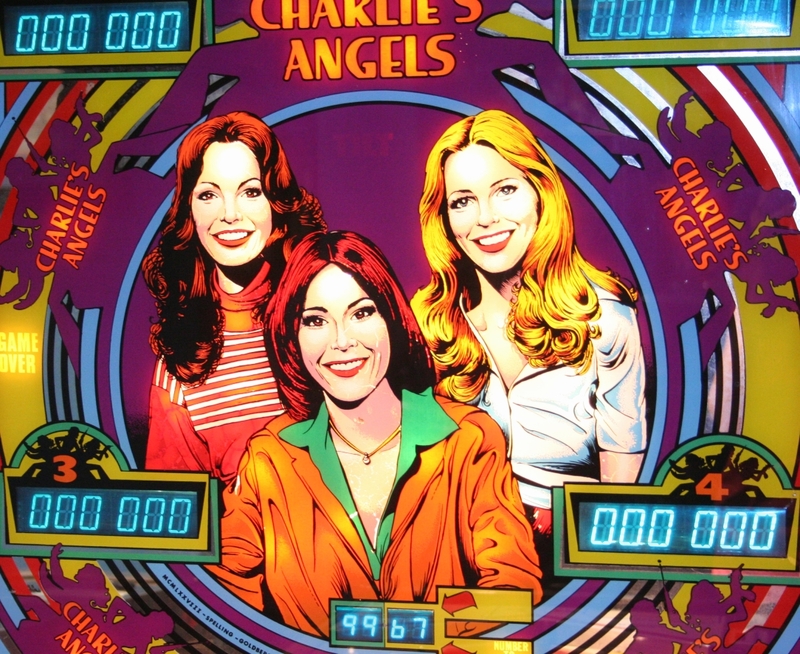 The symmetrical playfield is balanced with the sexes–if a male appears on a right hand side plastic, a female will be featured on the matching left. 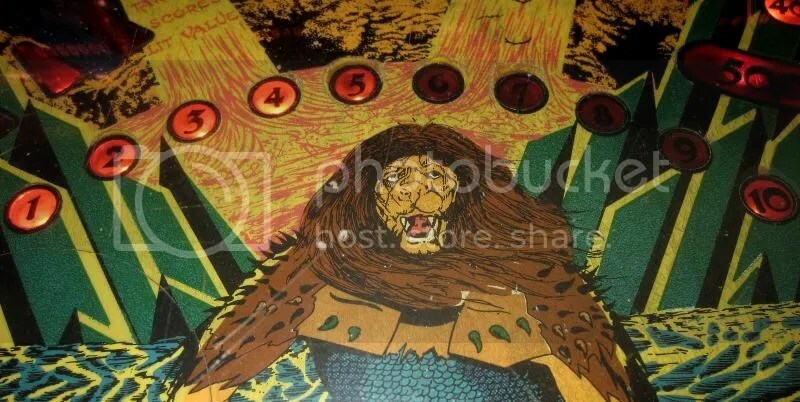 Sample Volleys had a different playfield art package than that of the regular run. Gone are the unpainted wood tones near the apron and top arch, and are replaced with a pastel blue leaving no bare wood anywhere. A different rendering of a female, with a shorter skirt and a “bigger” forehand swing, replaces buxom blonde. 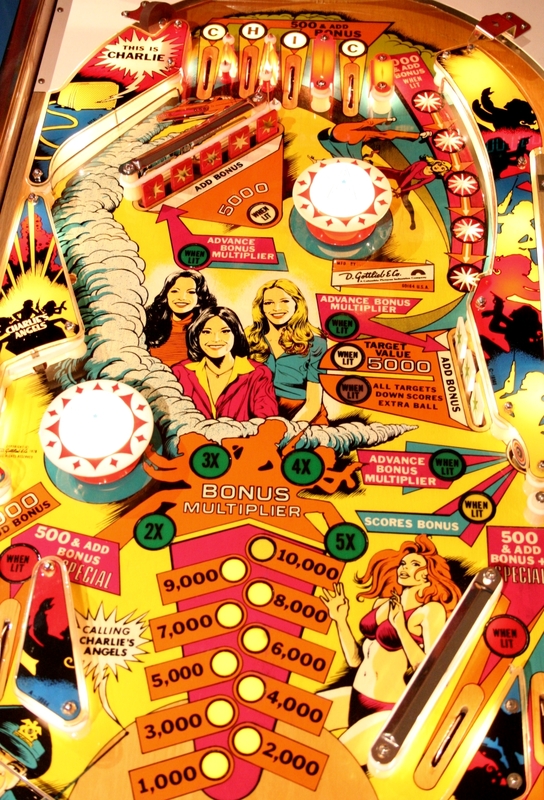 Bloated, “70s style” lettering and numbering appears around the inserts indicating scoring and point values, whereas the main run was changed back to the black block caps used in nearly every game of the era, regardless of manufacturer. The production version of Volley towed the Gottlieb line by displaying all their usual characteristics-the sample game, in contrast, looked as if it was trying to deviate. 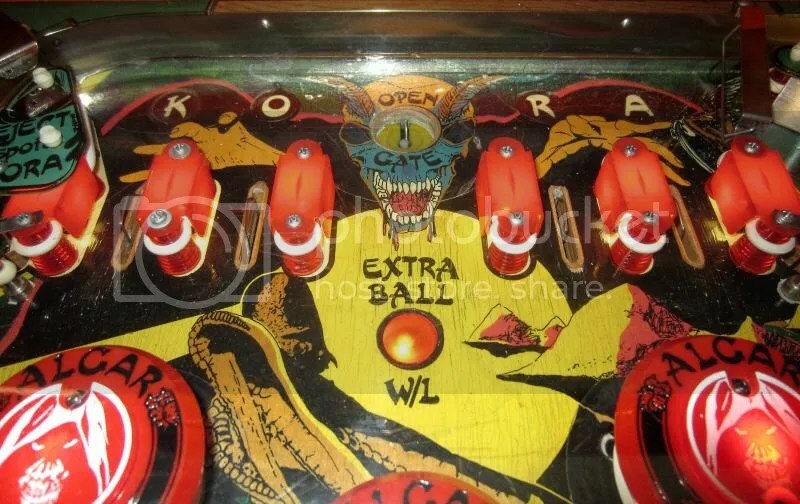 David Gottlieb’s company became the gold standard of pinball in this era by sticking to the script, so much so that they allowed the same two guys to spearhead the design and art on the majority of their games. 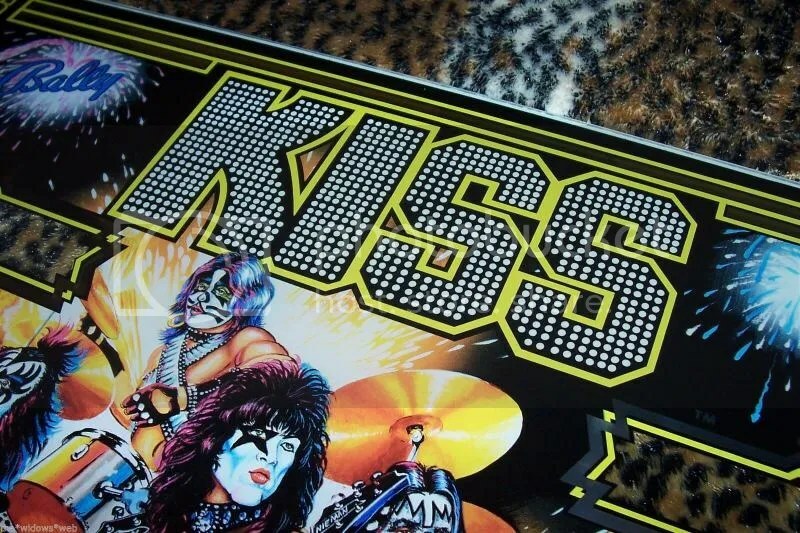 Perhaps this is the reason why the art on the sample games was abandoned for a more traditional art package? Gameplay doesn’t get much simpler. Three lanes lie under the top arch of the machine, each lane with a different coloured insert–red, blue and green. 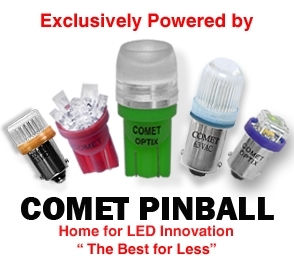 These correspond with the three pop bumpers and the three sets of five-bank drop targets below. If you are able to light one of these colour-coded lanes, the associated pop bumper scores 1,000 points, and associated drop targets score 5,000 instead of the normal 500. Once the lane has been lit, it stays lit for the entire game or until all fifteen targets are knocked down. A bit of strategy comes into play here. 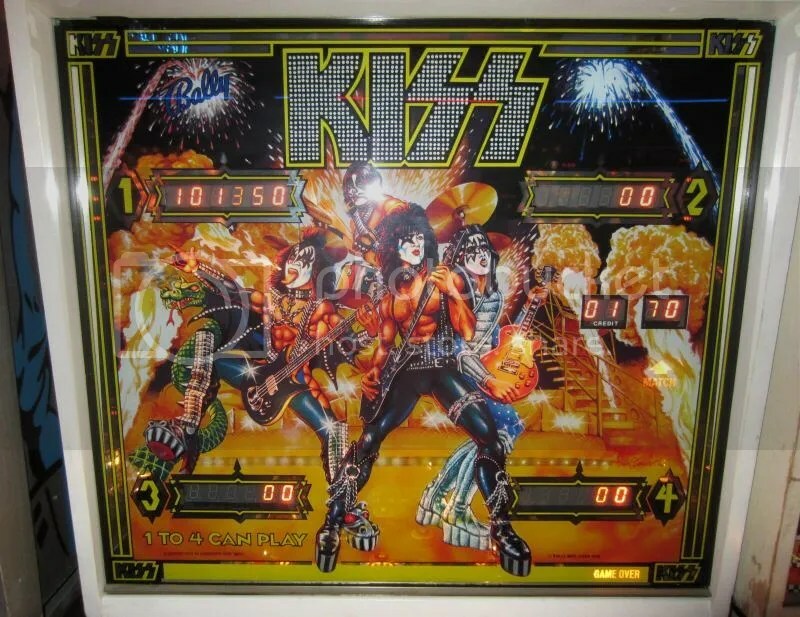 To maximize score, you will want to avoid the drops altogether until you are able to light all three lanes, then proceed to go on a target bashing spree at 5,000 points a piece. More difficult would be to attack one colour at a time–you are bound to knock down a bunch of unlit colours, losing a ton of points in the process. You can, however, just focus on the targets and go after the special. The special is lit when all targets have been dropped-it alternates between the left and right upper lanes. The centre yellow lane is worth 5,000 when lit and will light with the special. And that’s about it really. 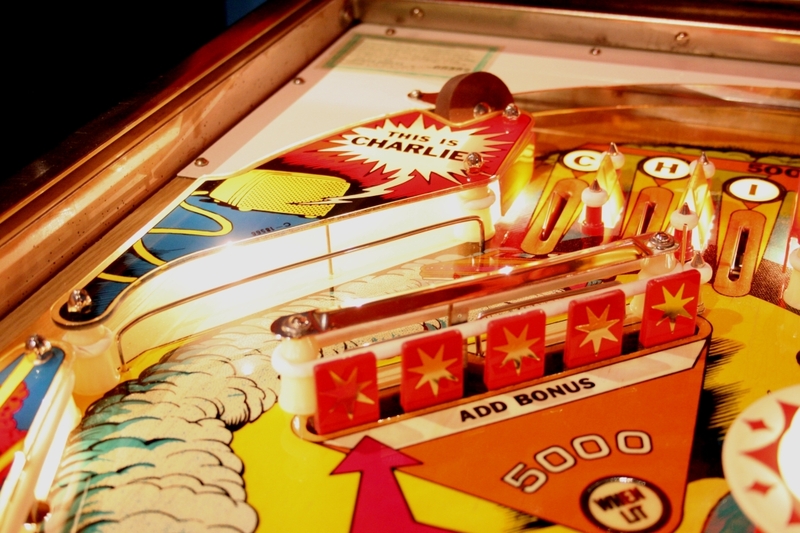 Gameplay is mostly flows up and down–there is not much side-to-side action as the slingshots have no kickers beneath them. 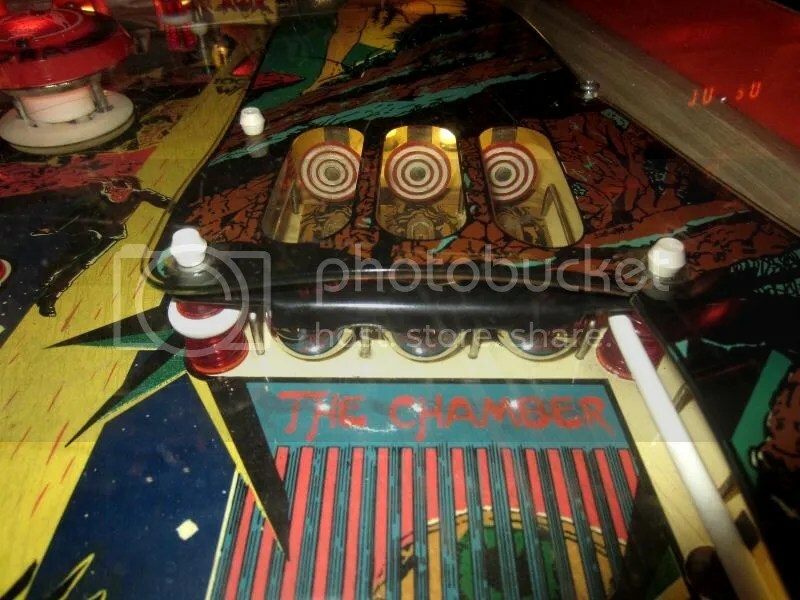 Mostly, you find yourself trying the fling the ball to the upper lanes in order to start the drop target frenzy. The yellow bank that sits dead centre is brutal, a dead on hit often sends the ball straight down the middle. 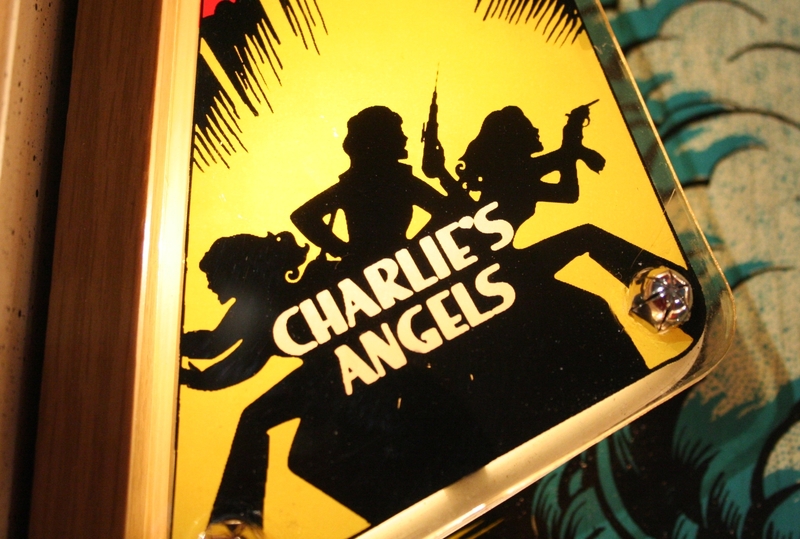 Much like El Dorado before it, the fun factor in this game lies in the drop targets. If you don’t like drops, you probably won’t like Volley. 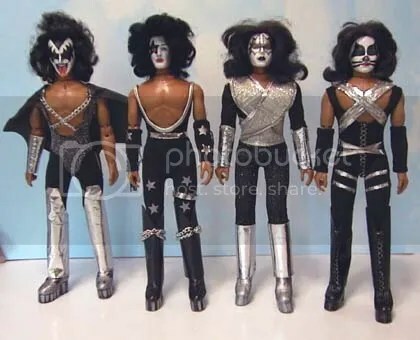 The production run of Volley sits at a modest 2,900 units, falling well short of the bar set by other 1976 releases such as Target Alpha (7,285) and Royal Flush (12,250) and also behind those releases that existed in multiple versions like Buccaneer/Ship Ahoy (combined 4,800) and Surf Champ/Surfer (combined 3,770). 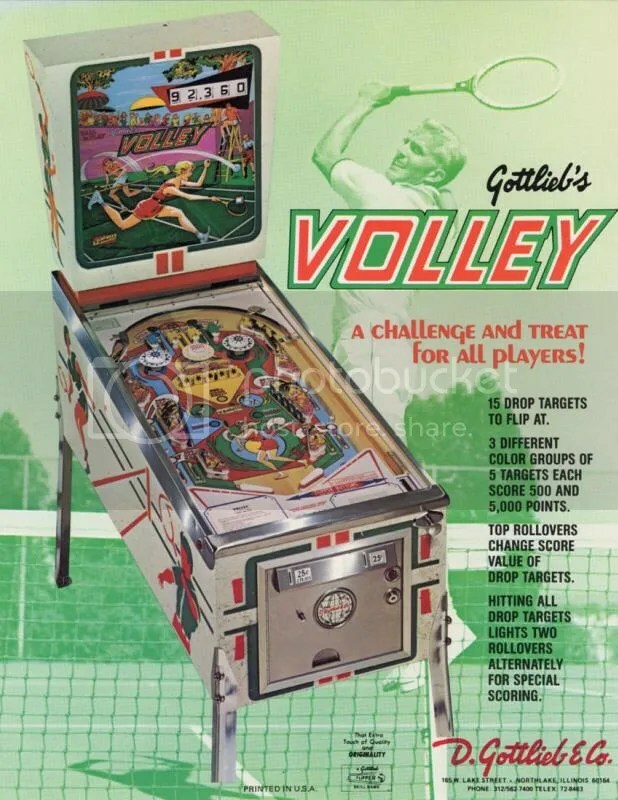 Volley was one of the last original releases from Gottlieb before they were sold to Columbia Pictures. If the sale did not occur, I believe Volley probably would have be tweaked to accommodate the Add-a-Ball or 4-Player treatment. In the year between Volley and Gottlieb’s first solid state game, Cleopatra, little was seen in the way of design innovation, and the company instead relied on repackaging old designs and rule tweaks for past games. In a way, Volley marks the end of an era filled with innovation and success for Gottlieb. 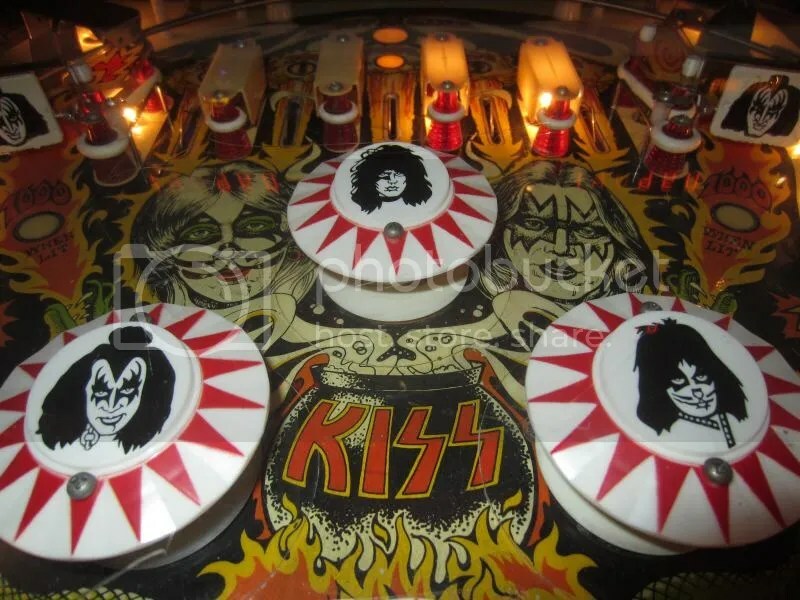 and it is fitting that the design and rules are very simple, yet fun and extremely entertaining. As Mr. Baraké stated above, this Laniel phenomenon is not exclusive to Volley and extends to other releases of the same period. It is not conclusive evidence, but it seems pretty reasonable to believe this was the factor at play. 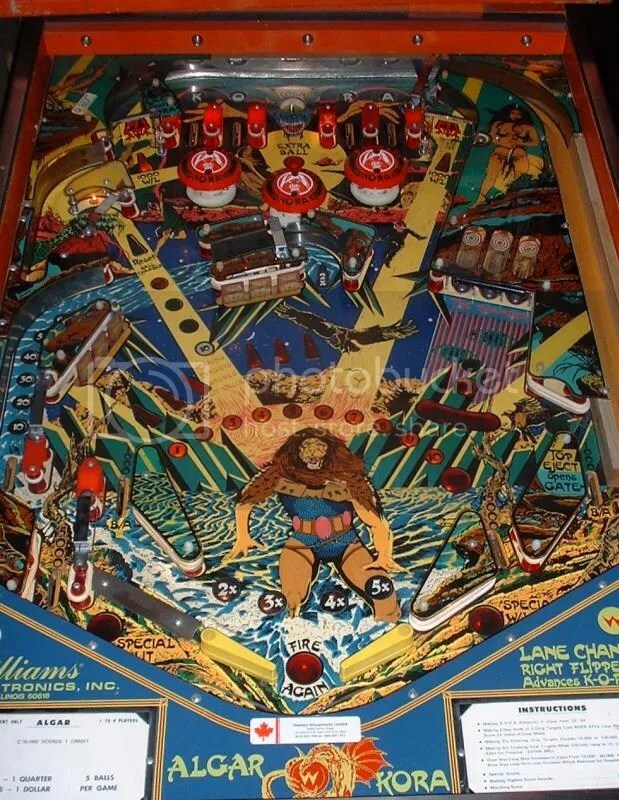 It is interesting how historical details can intersect with pinball releases to influence not only their theme, but their overall appearance and performance in the marketplace. As we conclude this brief look at Volley, I’m left to wonder what the coinbox take for Volley was in the fall of 1976. Did the theme matter at all to hungry Canadian players? Or were they looking for something, anything, with two flippers and a coin mechanism to drop twenty-five cents into? After all, you can’t get any less Canadian than surfing and tennis, and those two themes were probably dominant on routes during that time period. It would be interesting to research, as it would put a fascinating spin on the age old question “Does theme matter?” When it comes to this game, it doesn’t. I don’t like tennis. But I absolutely adore Volley. 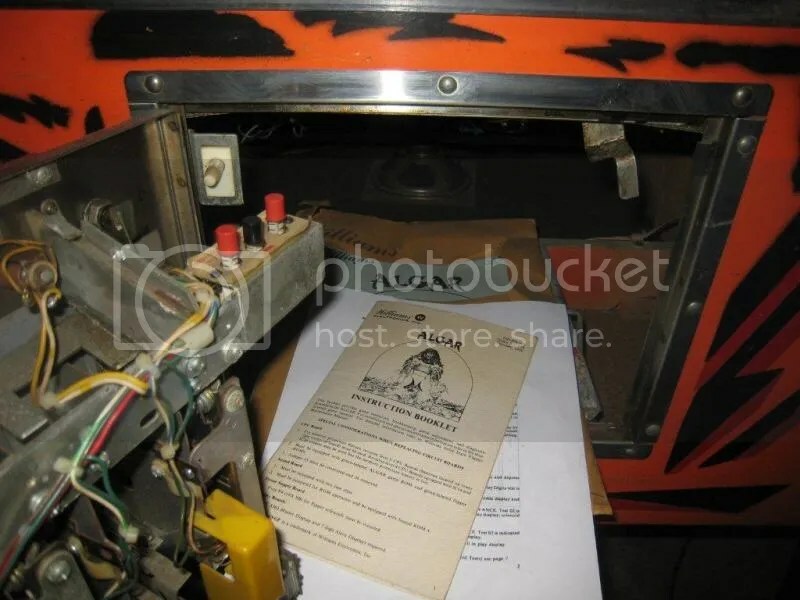 I’d like to thank Robert Baraké for helping to fit the pieces together–he has a great historical eye and is an asset to the Canadian pinball community. 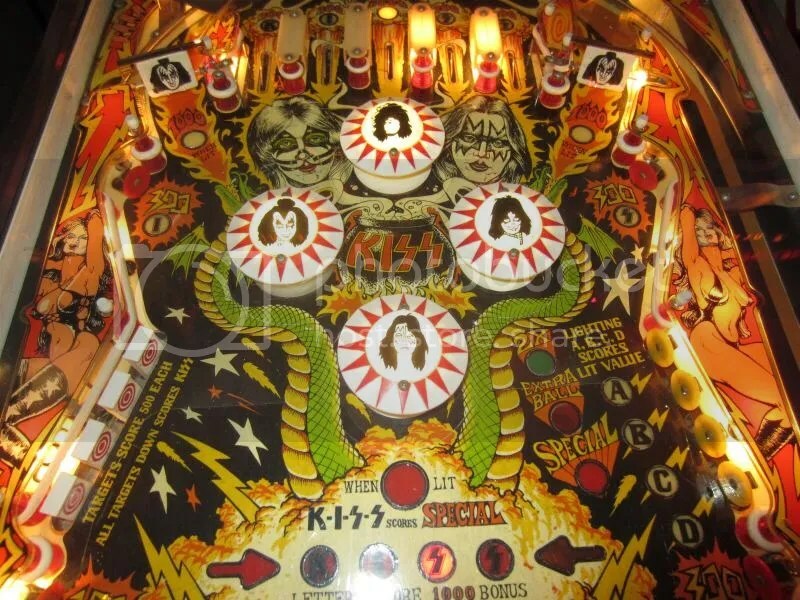 Also, please visit IPDB.com here to view pictures of the sample Volley playfield. I hear they are pretty strict with their copyright policies so I did not lift the images to display them within the article. 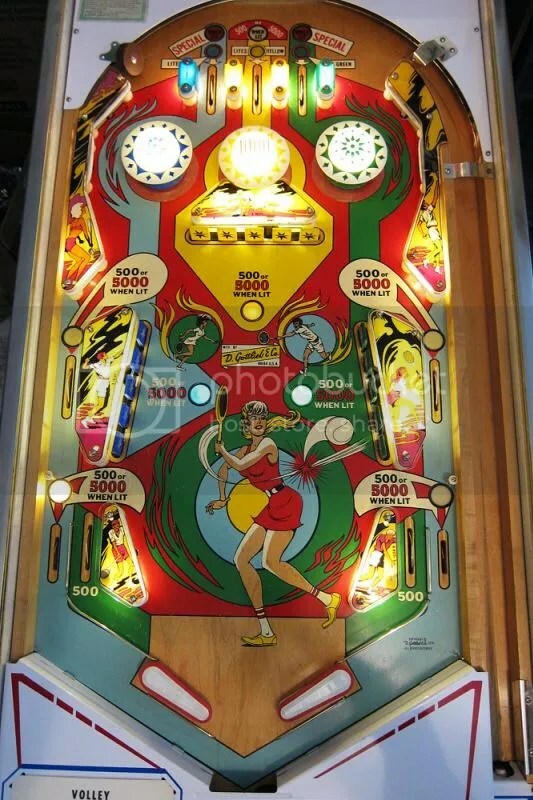 Categories: Featured Game | Tags: Battle of the Sexes, Billie Jean King, Bobby Riggs, El Dorado, Gottlieb, Laniel Automatic, Surf Champ, Tennis, Volley, Wedgehead | Permalink.